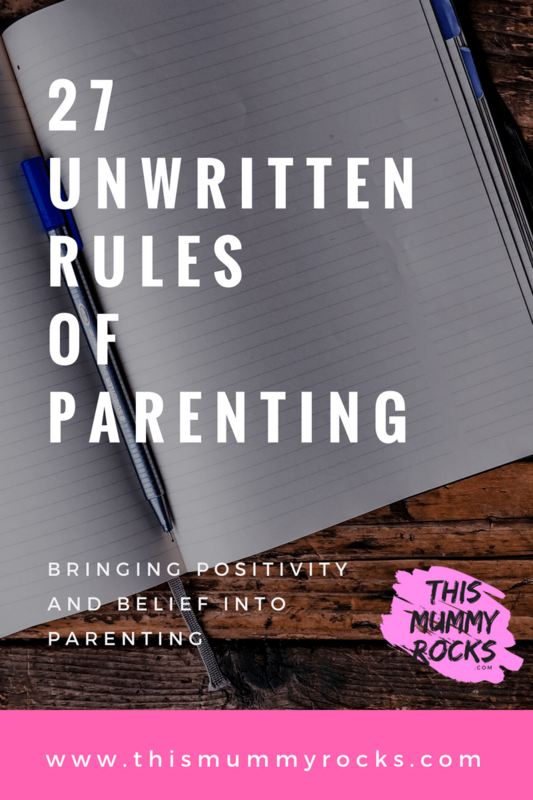 27 Unwritten Rules Of Parenting Let’s all face it, as parents at some point on our parenting journey’s; we’ve all experienced criticism regarding our parenting and how we ‘should’ raise our children. Majority of this ‘advice’ is given to us when we haven’t even asked for it. It’s upon the other persons inspection, them speaking their mind. People telling us how we ‘should’ be parenting our kids. The way we ‘should’ be feeding them. The type of nappies we ‘should’ use. Telling us how to discipline our children when they are having a tantrum in public. Telling us the ‘old wives tales’ about if we do something or other it’s guaranteed to be the best thing ever for our children. Even after having 5 children myself, people ‘try’ to give me, shall we call it ‘critical advice’ regarding my children. I kindly remind them that I will take it their ‘advice’ into consideration, but do they actually know my children and explain to them that not every child follows those parenting textbooks. You know, the ones where a baby feeds every 4 hours from birth, sleeps through the night by 6 weeks and never cries. In reality, that just doesn’t happen from some parents. I know that some people do actually mean ‘well’ by their comments and advice, but maybe if they didn’t make it seem like we aren’t good enough and make us doubt ourselves. Because I don’t know about you, but thats how I felt. That I was doing it ALL wrong. I’ve now got to a point now that when I work with professionals such as health visitors and GP’s for my children they actually say, ‘well you have had 5 children, I trust your judgement’, that I’ve even taught them a thing or two from my experiences. I don’t know everything about parenting, but i do know how to parent MY children. Which is a huge change in attitude from when I was a single young mum of 2. Back then, I was seen as the ‘over exaggerated’ inexperienced mother. At the end of the day we all want to to do the right thing for our children, by having their best interests at heart. We want to feel like are, actually doing our best for them without being pulled down by others and their opinions. Boundaries boundaries boundaries. There’s no need to be strict but once they have the run of the house, you’ll never get it back. They need to know what to expect. I hope that these ‘27 Rules Of Parenting‘ have given you some positivity and confidence that you’re not alone.